Client and server are directly connected through a CAT6 cable on a dedicated gigabit interface. The idea is to count how many packets the server can handle while minimising the "external" factors. Therefore, no switch or other hardware is placed between the sender and receiver. A single pcap file with 6 000 000 UDP DNS query packets was created. We used tcpreplay on the client to send a number of packets to the server at a predefined rate. We calculated the reply rate by multiplying the reply ratio (answers recieved/queries sent) with the send rate. E.g. a send ratio of 100Kqps (100 000 queries per second) and a reply ratio of 80% would result in 80Kaps (80 000 answers per second). 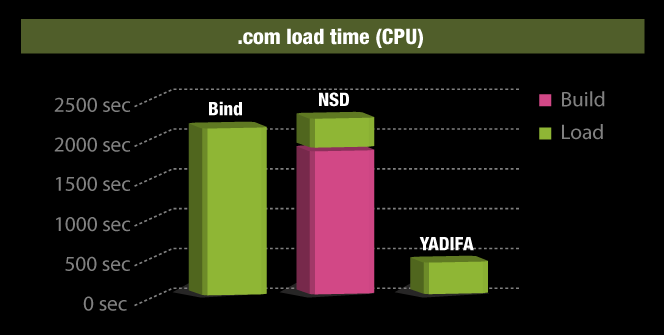 These four bar charts show the CPU load time and the zone memory usage for YADIFA, Bind and NSD. 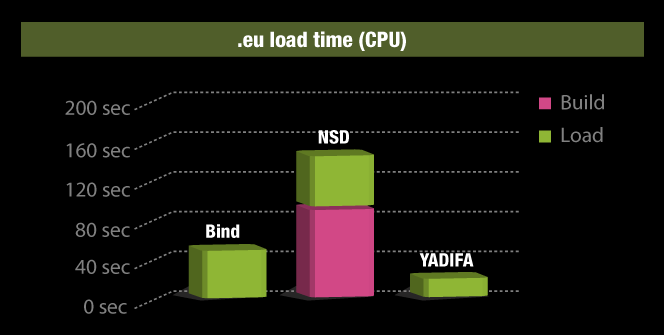 The CPU load time graphs show the time the CPU needs to load the .eu and .com zones. 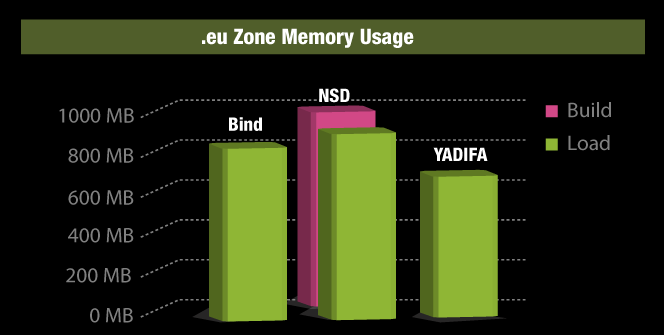 Memory usage refers to the amount of RAM used once the zone has been fully loaded. 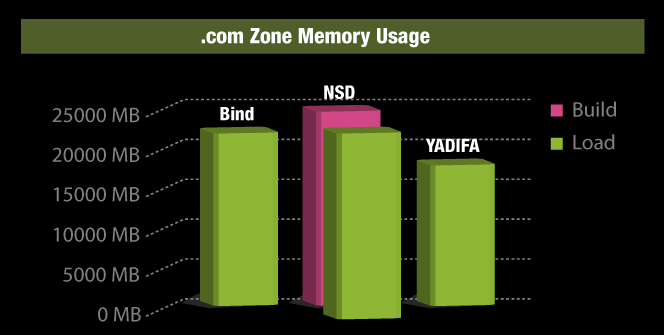 The build time is the time required to compile the zone file for NSD. The graphs below show the query rate on the x-axis and the answer rate on the y-axis. Click on an individual test to enable/disable the graph.